In this article, Terminal Server printing guru Stefan Vermeulen (webmaster for printingsupport.com and fellow BriForum speaker) explores the new UPD printing capabilities that Microsoft is building into Service Pack 1 for Terminal Server on Windows 2003. Now that Citrix has yanked the chain of third-party printing solution providers by creating an EMF-based printer solution for the upcoming MPS 4.0, it’s Citrix’s turn to bite the bullet. Microsoft has very quietly added a new feature to Service Pack 1 for Windows 2003 server. With SP1, open the group policy editor and go to Computer Configuration | Administrative Templates | Windows Components | Terminal Services | Client/Server data redirection. You'll see a new policy item called "Terminal Server Fallback Printer Driver Behavior." The last option is quite interesting, as it could be that your local printer responds better to a PS then a PCL print job and vice versa. The term PCL and PS sound very similar to Citrix’s Universal Print Drive (UPD) I and II technology, so it looks like it will behave the same. There isn't much official mention of these functions by Microsoft other then some obscure programmer's references in this preliminary MSDN article. Of course this new driver will hit the same limitations as the Citrix version did, such as not working on host based printers, no support for duplexing, etc. On the other hand, choosing to name this function "fallback printer" instead of "universal printer" like Citrix did is a more close approach of the truth, and the fact that it comes for free is a nice extra. I've tried to get this new fallback printer to create but was unable to. After ripping apart the ntprint.inf on the server and looking in every corner for a clue, I came to the conclusion that either this technology is not fully implemented in SP1 RC2 or I've missed something to get it running. Hopefully the final release will tell what exact driver(s) is/are used as a fallback. After some tips from a Microsoft engineer I got it up and running--it’s running fine now (read the comments at the bottom of this article for more information). The PCL driver is indeed the “HP Deskjet 500” and the “HP Laserjet 4/4M PS” is for PS. Both drivers are the default ones from the win2k3 driver.cab file. 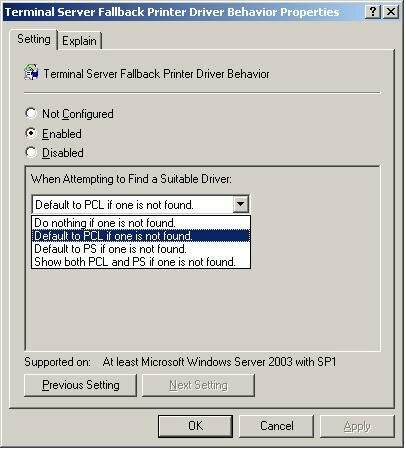 after reading, I immediately checked my Windows 2003 Standard server with SP1, but i didn't see the "Terminal Server Fallback Printer Driver Behavior." policy. I also reloaded the administrative template, but it did nog appear. is it possible that it's nog included in the Standard edition? Maybe there are new adm-templates that haven't been released yet. Final SP1 isn't out yet. I used the latest SP1 RC2 realease for this, so it could be that it was not present during the previous SP1 version yet. I got it running without problems. A print job generated on the server side is not reprocessed by the client side driver. It turned out to be a missing driver.cab file on the server. It is working flawless now, so i will dig into it a little deeper to find out it's potential. Does anyone know if MS have actually enforced the 'Per User' TS client licensing model in SP1 or is it still unfinished (at the moment you can choose to use it but you do not actually need TSCALs)? No, this is not yet enforced. I have just checked the final release of SP1 and the fallback printer driver has been included. Fantastic. We were struggling and this article totally helped us solve our Terminal printing quirks. I had an HP Photosmart 7550 that I could not use and now I can. Thanks for tips on how to setup fallback printer for server 2003, sp1. Is there a way of controlling the fallback printer driver to only create the default printer? (not the fax driver for multifunction printers, other installed printers, etc). Citrix has it's own fallback driver (the UPD's), why would it use the win2k3 ones? When I log into Citrix, no local printer is listed. I am using a hp LaserJet 1160 series printer. I am running SP1 on my licensing and TS servers and it still does not decrement the User Cal's. I think I'm missing the driver.cab too. Can you tell me where you found it and where it needs to go on the server?? If you don't have Citrix, why would you need one for Citrix??? Any help with this would be greatly appreciated at our company we are having the same problems with the 1160. Te other problem is that when it does print it is a lot of characters. all of the problems came after we upgraded the Citrix to 4.0. Not possible to roll back.